Under fire, Wells Fargo is speeding up the demise of the controversial sales goals that fueled the bank's embarrassing fake account scandal. 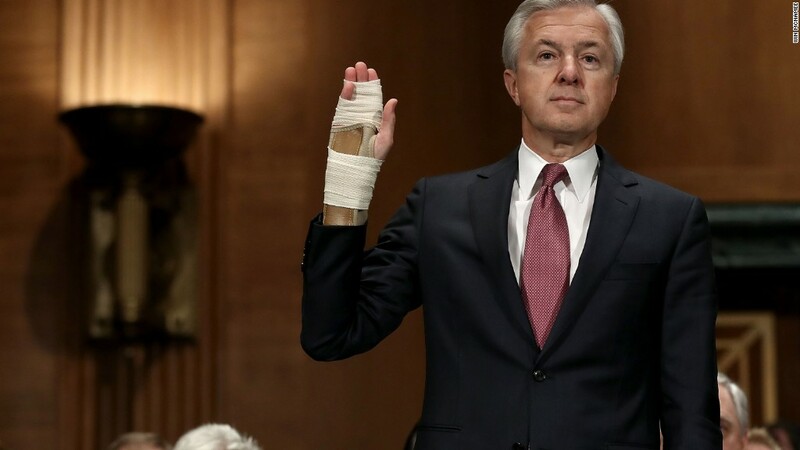 Wells Fargo (WFC)CEO John Stumpf plans to tell Congress on Thursday that the much-criticized sales goals will be dropped effective October 1, according to prepared remarks of the executive's testimony obtained by CNNMoney. The bank had previously announced sales goals for retail bank employees would be scrapped on January 1. Former Wells Fargo employees have blamed wildly unrealistic sales goals for fueling a pressure-cooker environment that led to the creation of as many as 2 million fake bank and credit card accounts. Stumpf, who is forfeiting $41 million in stock awards and part of his 2016 salary and bonus, plans to say the move is being driven by a desire to "focus on rewarding excellent customer service rather than product sales." It's also a reflection of the firestorm that is engulfing Wells Fargo, which was fined $185 million earlier this month for the fake accounts. A stunning 5,300 employees were fired over several years for improper sales tactics. Other former workers tell CNNMoney they were terminated after calling the ethics lines to flag illegal sales tactics. The rest of Stumpf's prepared remarks mirror what he said last week in a separate hearing before the Senate Banking Committee. He once again plans to say he's "deeply sorry" for the fake accounts but deny an "orchestrated effort" to scam customers.